What my hands and Erik Homemade can do! from everyone @ Erik Homemade! Our NEW block-of-the-month mystery quilt! Begins soon! Celebrate YOUR family! Click here to see what great things our readers are making from our projects! Click here to see our readers BF Mystery Blocks! 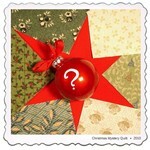 Click here to view photos our readers have sent us of their Christmas 2010 Mystery Quilt! Click here to view the Scrap Pile Mystery quilt photos our readers have sent us! Rolling through NW Ohio, SE Michigan...and points beyond! Cut a quick template from contrasting scrap fabric to make trimming a breeze! The fabric sticks to the piece you are trimming and makes it easy to turn the pieces on the cutting board! 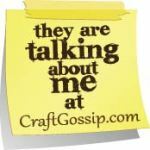 March is National Craft Month in the USA! Check your local craft and hobby stores as well as yarn and quilt shops for exciting ways to celebrate the passions you love! 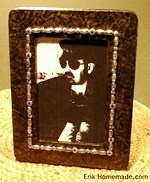 Photo sources: "Craft On" tin; Michael's Craft Stores, button fabric; fat quarter from Erik's stash. Come back and see us again! Erik Homemade is still a Bluprint Affiliate! 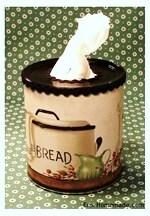 Click here to enroll in a class, buy patterns and supplies, or explore the all NEW Bluprint.com! Benjamin Franklin Mystery Quilt. Click here for the latest information and patterns posted to date! How to Share Erik Homemade! Tweetin', Tootin', and good ol' word of mouth! A Growing Site from Erik Homemade! 2019! Our NEW block of the month project announced! More information to come! We are finalizing things for you!